In 2005, SharePoint Solutions boosted the power of SharePoint Alerts by releasing WSS Alert Manager for Windows SharePoint Services v2, and SPS Alert Manager for SharePoint Portal Server 2003. Since then, hundreds of companies from around the world have augmented their SharePoint alert capabilities with our add-on software for alert management. Alert Manager for SharePoint 2007 leverages the success of our market-leading alert management product line, bringing you a new level of flexibility and control for managing your user’s SharePoint Alerts in Windows SharePoint Services v3 and Microsoft Office SharePoint Server 2007. As you would expect from the market leader, no other SharePoint alert management product available today comes close to providing you with the powerful feature set of Alert Manager for SharePoint 2007. Our award-winning software engineering team invites you to compare AM2007’s rich feature set, and evaluate Alert Manager for SharePoint 2007 in your own environment. Virto Alerts Customizer for SharePoint provides users with this additional adjustment tool. Now you can create your own task alert in an instant, and allow it to be sent to a specific user or a group of users. An important feature with the Virto Alerts Customizer is the ability to create your own alerts in Rich Text format. business hours — from 8 AM to 5 PM). All of this can then be combined into a single ticket. When you enable this feature, all of your alerts will be assembled into a single email instead of being sent in several email messages. Finally, Virto Alerts Customizer allows sending SharePoint alerts and notifications not only by e-mail, but also by SMS or via instant messengers like Jabber or Miranda. Another feature of the Virto Alerts Customizer is the Custom Filtering System. This allows users to create complex terms and conditions for sending notifications. An example would be for you to receive notifications when your task is complete or the percentage of completion is more than 90%. The option of Custom Templates makes it possible to create the Body of the Alert message within seconds. The Virto Alerts Customizer Message Templates enables users to use different tags in the HTML-based template body. The tags are replaced with the Alert List column fields and other elements while the message is being drafted. Send Alert email to SharePoint users/groups when item is created, modified or deleted. Currently, SharePoint users (MOSS and WSS 3.0) can view and edit the alerts they’ve set up for a particular list or library, or even individual items. However, this fragmented view makes it is easy to forget which alerts you’ve set up and which ones you need to set up within a site or site collection. Users don’t have a way to manage all of their alerts, from a single location for each site within a site collection. The Bamboo My Alerts Organizer provides users with the ability to view all the alerts they have setup for each site in a site collection from a single view. Users can access the My Alerts Organizer right from their SharePoint site through the user’s personal menu. This feature allows users to easily create new alerts, group alerts, enable/disable alerts, delete alerts, and perform inline editing of alert frequency settings. 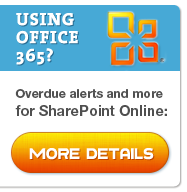 Alerts in SharePoint are frequently underused. One of the main reasons is that users are often inundated with an unnecessary amount of alerts whenever a list is touched – diminishing their significance. Alert Plus Web Part gives users the ability to only receive alerts for very specific conditions, helping your end users manage their tasks more efficiently and consistently. The Alert Plus Web Part allows you to easily set up and receive customized notifications alerting you to a variety of conditions or changes in a SharePoint list, such as when a task has been added to the portal, tasks are coming due or overdue, or a new version of a document is added to a document library that needs review. SharePoint already has a built in Alerts feature but this is limited to sending out emails when items in your list are changed by users – for example when a new task is added. SharePoint Reminder adds the ability to send out emails on date based events – for example it can constantly monitor a Task List and when an item is due send a ‘This Task is Due Soon’ email to the person who has been assigned to complete the task. It can also send out another email if a task becomes overdue. Task Management: Send reminder emails when Tasks are approaching their due date – then another once they are overdue. Helpdesk Management: Escalate an issue if it hasn’t been resolved within a certain time of being logged. Enhanced Alerts: Gain more control over email alerts including who gets them, under what circumstances and customise the text of the email. Simple Workflow: Use SharePoint Reminder to drive simple workflow by sending emails when a task is ready for the next stage in a business process. Equipment calibration and testing: Help manage the regular calibration and testing of equipment while keeping an audit log for compliance purposes. Document Management: Send a reminder email to a document author once its past its review or archive date. Event Lists: Remind people of important upcoming events or meetings.